In roofing, it is vitally important that you work with tradesmen you can depend on. One of the most tiresome things for anyone to have to ensure is waiting around for a tradesman who never shows up. Your time is precious, and you need people to arrive when they say they will, so that you can properly plan your day. This is so basic that one would think it did not need to be said. However, there are those who seem unable to meet this simple requirement. And if you want to avoid working with a roofer of that kind then it is important that you get all of the information you can about the contractors in your area before contacting them. Indeed, it is important to remember that not every roofing contractor offers the exact same quality and value. If you want to get great work done at a reasonable price, then you need to work with a roofing contractor that has an established reputation for craftsmanship and fairness. The roofing contractor should be able to provide you with a clear plan of action for repairs or replacement. He should also be able to give you a price estimate on the work. One of the most important parts of getting work done is having the ability to plan for it financially. You need to know how much the repairs will cost so that you can make the right financial decisions in meeting it. A roofing contractor can also help you look at options for more extensive roofing work. The Palo Alto, Sunnyvale area of California is not prone, on average, to large, hugely disruptive storms. However, it does get its dose of rain and wind storms from time to time; and these phenomena can have a serious impact on the roof of a home. It may be the case that your roof has suffered severe damage because of a storm. If that is the case, then you may need to replace it. Replacing a roof is a significant operation, but it need not be overly costly or overly burdensome. As with most things having to do with maintenance, the process and price of the work greatly depends on the contractor you work with. Protecting your home from the elements is one of the most important things that you will do as a homeowner. Having a roof that is strong, sturdy, and in the utmost condition materially is an essential part of keeping your house in good condition overall. When your roof is leaky, or when you feel an unusually forceful draft coming from the upper parts of your home, the best thing to do is to call a roofer to come and have it looked at. 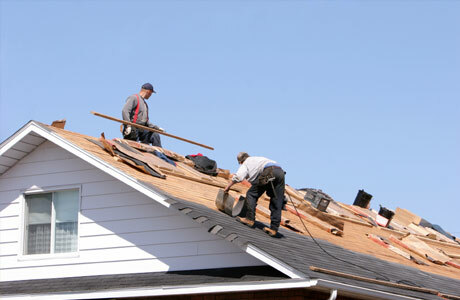 Professional roofers can be found throughout the Palo Alto area. Contacting a roofing contractor will enable you to quickly discover the extent to which there is a problem with your roof. Such a professional can also plan any repairs that the roof may need in order to be fully restored.